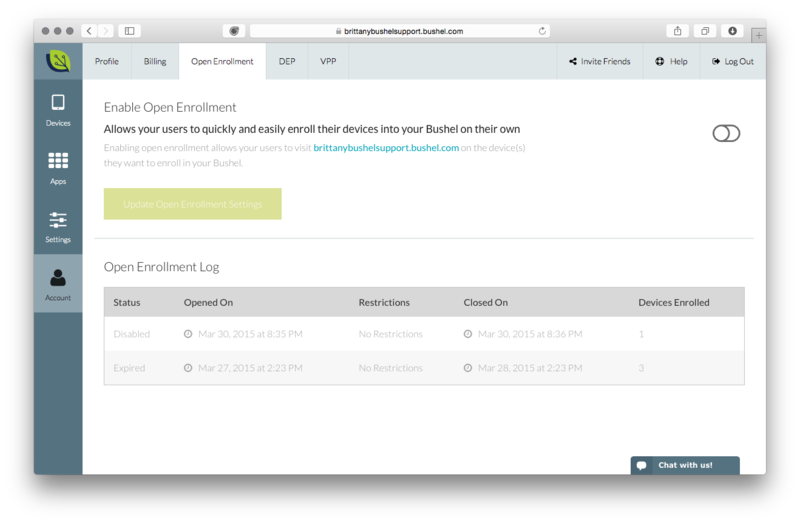 Open enrollment is the tool that allows all of your users to add their Macs and iOS devices into Bushel themselves. You don’t need to share your Bushel username and password. 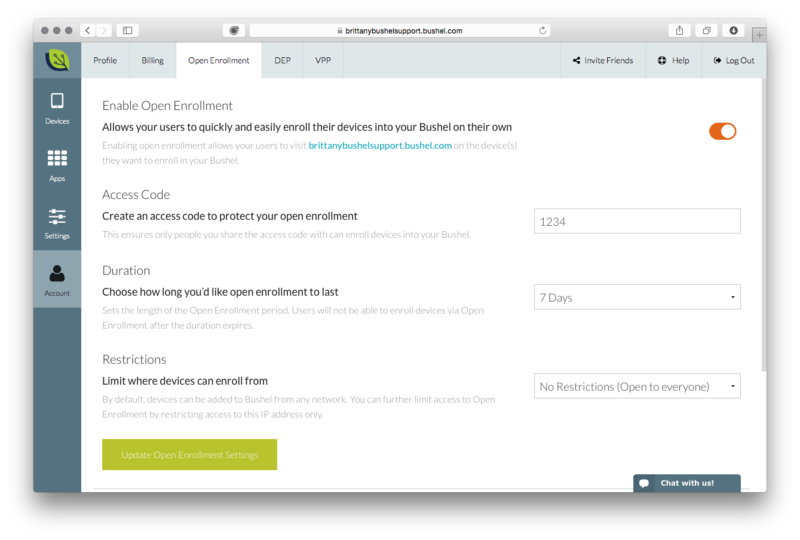 Instead, you simply share the Open Enrollment URL (example: yourcompany.bushel.com) along with an Access Code (PIN). Your users will navigate to this link on their devices and enroll into Bushel. Here is a step by step guide on how to set up Open Enrollment. Next, click on Account in the Blue bar on the left side of the page. In the account settings, click on the Open Enrollment tab across the top of the page. The switch on the right side of the window will toggle Open Enrollment on and off. Click on the switch to turn on Open Enrollment. You will now have a few set up options for Open Enrollment. Input an access code. You will give this code to your users to enroll their devices to your Bushel account. They cannot enroll their device without this code. Select a duration of time you would like to have for Open Enrollment. You have quite a few options to choose from. 7. You also have the ability to restrict Open Enrollment to an IP address. Once you are completed with these options, click on the green Update Open Enrollment Settings at the bottom of the page. That’s it! Now you can send your users to yourdomain.bushel.com and they can enroll. Stay tuned for more How Tos here on the Bushel Blog.